Being of father of 4 can be difficult, especially when their energy and tiredness is rearing it's head during mass. This book can definitely help. My kindergartner and first grader love this book, but children of any age could have fun. The pictures lend themselves nicely to be colored, but they also have many activities such as grid drawing, object searches, unscrambling words, mazes, dot-to-dot, number games, crossword puzzles, word searches, matching, and even more! With 64 pages, it will keep your child engaged for a long time and of course it is all faith based, so it lends to great conversations and stories. And don't worry parents, they even have the answers listed in the back of the book. Teachers and catechists, the copyright of this book even allows you to photocopy pages to use in your classroom! This review was written as part of the Catholic book reviewer program from The Catholic Company. 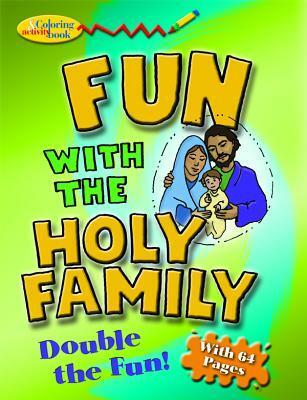 Visit The Catholic Company to find more information on Fun with the Holy Family. The Catholic Company is also a great online store for all your Catholic gift needs, such as baby baptism and christening gifts. You can also find a wide selection of Catholic Bible Studies for both parish groups and individuals, as well as a variety of other Catholic Bible study resources.